Most carpet cleaners use a manual carpet cleaning wand. This method of cleaning depends on the strength, stamina, and technique of your carpet cleaner AND the strength of the chemicals that he or she is using. First and foremost the Rotovac is an electric power tool. Comparing the Rotovac to a wand is like comparing a skill saw to a hand saw. We have converted a back and forth manual task to a much easier and more efficient rotary mechanized operation. The Rotovac makes more cleaning passes per minute than is possible with a manual scrub wand. In addition, the cleaning passes are from all directions rather than just back and forth. This is what produces better cleaning results with far less operator fatigue. FIND A ROTOVAC CARPET CLEANER! 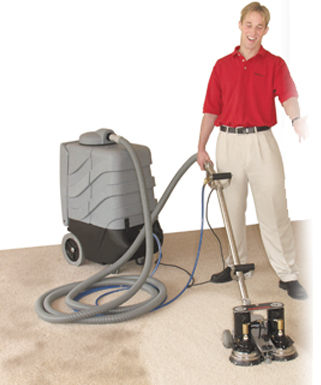 There are over 10,000 carpet cleaners who use the Rotovac PowerWand. Click here to find a carpet cleaner near you. Click here to see a map showing Rotovac Carpet Cleaners near you.